San Francisco is known for nature, museums, parks, nightlife, and shopping. Your plan includes some of its best attractions: snap pictures at Golden Gate Bridge, take in the waterfront at The Embarcadero, take in nature's colorful creations at Japanese Tea Garden, and stroll through Crissy Field. Plan a San Francisco trip in moments using our itinerary builder. New Delhi, India to San Francisco is an approximately 19.5-hour flight. You can also do a combination of train and flight; or do a combination of train, taxi, and flight. You'll gain 13 hours traveling from New Delhi to San Francisco due to the time zone difference. Expect little chillier weather when traveling from New Delhi in December: highs in San Francisco hover around 17°C, while lows dip to 8°C. Finish your sightseeing early on the 8th (Sat) so you can travel to Las Vegas. Change things up with a short trip to Hoover Dam in Boulder City (about 50 minutes away). And it doesn't end there: admire the local landmark of Bellagio Fountains, try to win big at Casino at the Venetian, enjoy breathtaking views from Eiffel Tower Experience at Paris Las Vegas, and see the interesting displays at The Mob Museum. For other places to visit, ratings, where to stay, and other tourist information, read our Las Vegas trip maker website . Fly from San Francisco to Las Vegas in 4 hours. Alternatively, you can do a combination of subway and flight; or drive. Traveling from San Francisco in December, you can expect nighttime temperatures to be a bit cooler in Las Vegas, with lows of 4°C. Finish your sightseeing early on the 12th (Wed) to allow enough time to travel to Los Angeles. Pack the 14th (Fri) with family-friendly diversions at Universal Studios Hollywood. There's much more to do: see the interesting displays at The Getty Center, immerse yourself in nature at Topanga State Park, admire the masterpieces at Los Angeles County Museum of Art, and admire all the interesting features of Staples Center. To see photos, traveler tips, and more tourist information, use the Los Angeles vacation planning site . Getting from Las Vegas to Los Angeles by flight takes about 4 hours. Other options: fly; or drive. Traveling from Las Vegas in December, expect Los Angeles to be somewhat warmer, temps between 24°C and 11°C. Finish your sightseeing early on the 16th (Sun) to allow enough time to travel to Niagara Falls. On the 17th (Mon), take in the dramatic scenery at Niagara Falls, hike along Niagara Gorge Trail, and then explore the fascinating underground world of Cave of the Winds. To see traveler tips, maps, more things to do, and other tourist information, use the Niagara Falls travel planner. You can do a combination of flight and bus from Los Angeles to Niagara Falls in 8 hours. Alternatively, you can do a combination of flight and bus; or drive. The time zone changes from Pacific Standard Time (PST) to Eastern Standard Time (EST), which is usually a 3 hour difference. Traveling from Los Angeles in December, things will get much colder in Niagara Falls: highs are around 3°C and lows about -3°C. Finish your sightseeing early on the 17th (Mon) to allow enough time to travel to Washington DC. Washington DC is known for museums, historic sites, nightlife, zoos & aquariums, and fun & games. 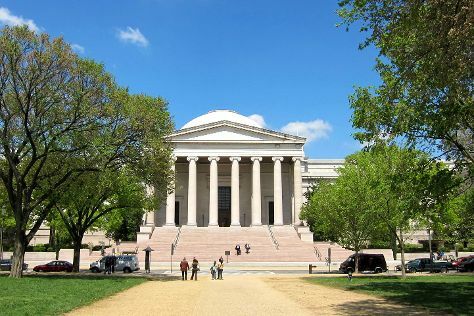 Your plan includes some of its best attractions: admire the masterpieces at National Gallery of Art, ponder the world of politics at Library of Congress, learn more about the world around you at Smithsonian National Museum of Natural History, and see the interesting displays at National Air and Space Museum. To find ratings, traveler tips, reviews, and more tourist information, use the Washington DC journey planner. You can do a combination of bus and flight from Niagara Falls to Washington DC in 4.5 hours. Other options are to do a combination of bus, flight, and train; or drive. Prepare for somewhat warmer weather when traveling from Niagara Falls in December: high temperatures in Washington DC hover around 12°C and lows are around 3°C. Finish your sightseeing early on the 20th (Thu) so you can travel to New York City. New York City is known for museums, nightlife, shopping, historic sites, and parks. Your plan includes some of its best attractions: take in the pleasant sights at Central Park, appreciate the history behind Statue of Liberty National Monument, enjoy breathtaking views from Top of the Rock, and admire the landmark architecture of Rockefeller Center. Fly from Washington DC to New York City in 3.5 hours. Alternatively, you can do a combination of flight and bus; or drive. Expect a daytime high around 10°C in December, and nighttime lows around 2°C. Finish your sightseeing early on the 25th (Tue) so you can travel back home.